News overnight from Wes Sanford at Northrop & Johnson that he has taken over the central agency for the sale of the 24.4m Hatteras cockpit motor yacht Triple Net, and she has also had a $200,000 cut to her asking price. 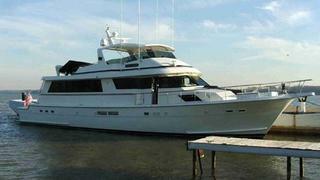 Built by Hatteras in 1990, Triple Net can accommodate up to 10 guests in 5 staterooms. She has been well maintained by a full time crew, and is available for inspection at Roscioli Marina in Fort Lauderdale. Her new asking price is $595,000.